AEI is, proudly, the sole distributor of Infratech heaters. Infratech is an industry leader for comfort heating both at home and in commercial settings. Infratech uses infrared heating technology to efficiently and effectively heat any desired area, indoor or outdoor. Infratech’s infrared heaters come in a variety of models and mounting options so that you can customize your heating needs as you see fit. We carry infrared heaters with different levels of heating capacity, and a plethora of accessories so that operating your infrared heaters are easier than ever. Our infrared heaters can be mounted to a wall, horizontally or vertically. Not every patio or outdoor gathering area is going to have a ceiling or covering that will allow the installation of an overhead heater. In cases like these, Infratech heaters can be attached directly to your wall. Being able to install an infrared heater to almost any wall, really opens up your customization options. By wall mounting, you can heat areas that would be otherwise difficult or cumbersome to effectively keep warm. If your wall permits, our heaters could even be flush mounted on your wall; this is extremely uncommon for a variety of reasons, but is possible. Conveniently, our infrared heaters can be mounted to a pole. This is especially helpful for patio areas with poles on the side opposite of the house or building. Pole mounted heaters allow you to avoid having to position unsightly portable heaters that take up floor space. Your pole could be part of a fence, or a support beam for an overhead patio. One of the most common mounting options; ceiling mounted infrared heaters are probably the easiest to install, have very low clearance requirements, and have a sleek design that blends easily into any setting. Mounted to the ceiling, your heaters are completely out of your way, giving you more floor space to use as you wish. Our heaters come in a variety of strengths and can heat effectively from 7-11 feet away. The most sought after heater mounting option is with a flush mount frame. A flush mounted heater is simply a heater that is installed into a recessed pocket so that the heater is flush with your ceiling. This option is desired because it really makes your heaters apart of your decor. The seamless mounted heater looks great, but this mounting option is much more difficult to install. A flush mounted heater should only be installed by an experienced contractor or certified installer. 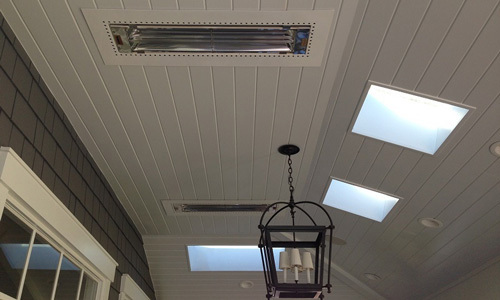 For starters, a heater-resistant pocket needs to be made in the ceiling where you want your heater installed(must have proper clearance from fans and/or other combustibles). Then flush mount frame for the heater needs to be installed inside the fire-resistant pocket. The heater is then installed to the frame inside the pocket; so that it is flush. Without following proper procedure, or using the correct drywall thickness; operating the heater could cause a fire hazard. That’s why a flush mounted heater should always be installed by a professional. If you have any questions about which heater will best suit your needs, or which mounting option you should choose, give us a call at 949-474-3070. AEI is the sole reseller of Infratech heaters, so we'll be able to answer any questions you might have.